2016 has started very well for tourism numbers and data released by the Spanish Airports and Air Navigation Authority (AENA) supports this. 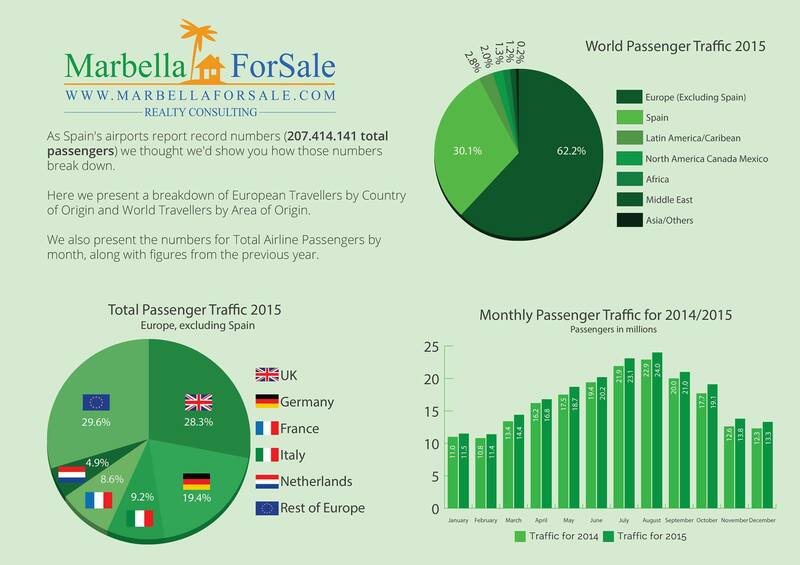 When looking at the first two months of the year Andalucian airports reported an increase in passenger numbers of 16.2%, when compared to the same period in 2015. The total number of passengers passing through was 2,374,543. February alone saw 1,243,314 passengers with over 14,500 flights. Málaga Airport was the busiest with 1,527,221 passengers passing through during January and February, representing an increase of 15.7% over the same period in 2015. The passengers were spread over more than 12,500 flight operations which is also the highest number of all the Andalucian airports. This was an increase of 11.9% over the previous year. Representatives of Málaga Airport said “continues on the path of growth with which it closed 2015,” with a rise of 17.8% in passenger numbers and a 14.5% increase in the number of flights during February 2016, when compared to the same month in 2015. Property prices across Spain have increase during the first two months of the year by 2.7%. The increase comes after a climb in prices through Q4 of 2015 and the property market has a positive outcome for 2016. In the first few months of 2015 prices fell to their lowest level since the end of the crisis so the recent increase is being hailed as the end of the recovery and the beginning of an upward trend. Prices increase across Spain and especially on the Costa del Sol where the increase was 6.1%. Despite the increases prices are still some way below pre-crisis levels. Prices on the Mediterranean Coast are still 48.1% lower than pre-2007. In Metropolitan Areas the difference is -44.7%. Across the board increases are good news for property owners but not so for buyers. There is also an ever-growing gap between prices around the country with Northern Spain continuing to be the most expensive area to buy property in Spain. Take for example a property of 80m². The Spanish average is 131,040 Euros. In the Northern town of San Sebastian you would be looking at 328,000 Euros, a massive 150.37% above the national average. In Barcelona the cost for a similar apartment is more than double the cost of the average with an average price of 269,520 Euros. In Bilbao, also on the Northern Coast, the average price of an 80m² apartment is 241,360 Euros which, while considerably lower than San Sebastian and Barcelona, is still 84.19% above average for Spain. The lowest prices are to be found in Jaen and Lleida where the same property will see you paying a paltry 89,600 Euros and 91,440 Euros respectively. The North is also the most expensive when looking at rental costs. Again, based on a rental property of 80m² the national average is 561.60 Euros per month. Once again, move North and you will see highewr costs. Barcelona records the highest prices and you should expect to pay 970.40 Euros per month, 72.79% above average. Back in San Sebastian and you will need to pay 940 Euros per month, 67.38% above average. The cheapest towns in Spain for rental properties are Lugo and Ourence. There you should expect to pay around 332 Euros and 351.2 Euros respectively.